Beebe Medical Center has honored eight nurses who work on the third-floor medical-surgical unit for their commitment to caring for the older patient. The nurses completed a rigorous education program and each nurse is now designated as a “Geriatric Resource Nurse.” The designation means that they have a unique knowledge and understanding of patients 65 years of age and older and the medical and emotional issues these patients face. This group of nurses works primarily with patients hospitalized on the third floor who either are recuperating from an operation, or who are suffering from any one of a variety of illnesses, often chronic. “The commitment by our nurses to take evidence-based medicine and put it into practice has become a culture across our organization and is why Beebe Medical Center is standing out in the community,” said Paul Minnick, RN, MSN, NEA-BC, Vice President of Patient Care Services and Executive Sponsor for the Beebe program. The education program is offered under the auspices of the Nurses Improving Care for Healthsystems Elders (NICHE) program, designated by New York University College of Nursing, Harford Institute for Geriatric Nursing. The core curriculum is based on the latest medical literature on caring for geriatric patients and includes discussion of case studies, clinical trials and outcomes. In 2011, Beebe Medical Center became one of about 300 hospitals in the nation to receive the NICHE designation. NICHE-designated hospitals follow evidence-based geriatric nursing protocols that have been proven to improve outcomes for the older patients. Nurses also learn how to handle specific issues that older patients face, such as temporary disorientation and confusion in unfamiliar surroundings, susceptibility to falling, and other symptoms related to aging. The eight nurses are: Amy Balasus, RN; April Benfer, RN; Linda Butts, RN; Mary Koyanagi, RN; Jessica Neville, RN; Dareth Penuel, RN; Robin Ritter, RN; and Patti West, BSN, RN, BC. Denise Larson, RN, MSN, Clinical Education Specialist and Nancy Bastholm, MSN, RN, members of the initial NICHE work group, also completed the program. 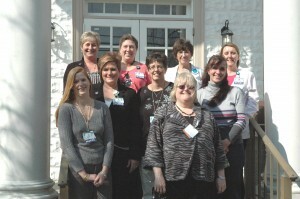 Beebe Geriatric Resource Nurses are pictured here with Margaret Porter, MSN, RN, BC, Nurse Manager. Back row: Patti West, BSN, RN, BC; Robin Ritter, RN; Margaret Porter; and Amy Balasus, RN. Middle: Jessica Neville, RN; Mary Koyanagi, RN; and April Benfer, RN. Front: Dareth Penuel, RN, and Linda Butts, RN completed the Leadership Training Program developed by Hartford Institute for Geriatric Nursing.